My girls like to come up with their own poses so here is my favorite. I was just happy that they weren't fighting. The ribbon ties feed through the front and the back and tie on one side of the dress. Peek-a-boo where's Abby? haha They were pretty proud of themselves for coming up with this pose. Want to make one for the little lady in your life? Here's how. I started by measuring the length of each girl from collar bone to knees then I added about 2 inches to cover all my seam allowances. 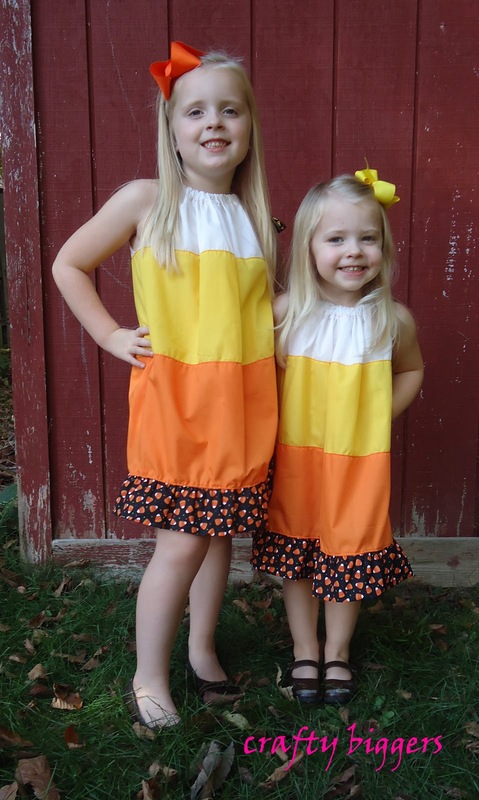 If you are just doing one color this is a much simpler dress, but since I wanted my girls to look like giant pieces of candy we had to do some math. I wanted the orange to be the longest, then yellow then white just like the candy. I used broadcloth to make mine which happens to come 22" across on the fold and that's the same width as a standard size pillow so I just cut straight across the full width of the fabric. This is what it should look like. 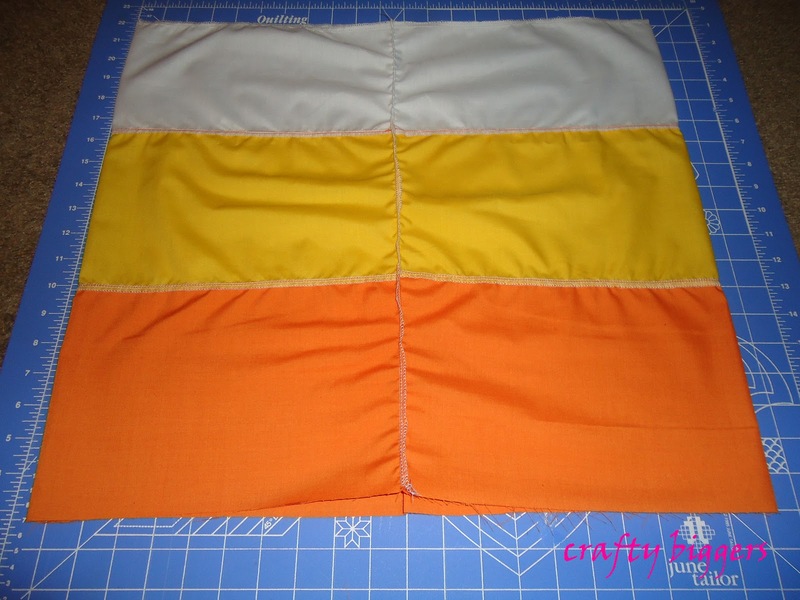 Start by sewing the 3 panels together with the right sides together. Make sure you keep them in the correct order. 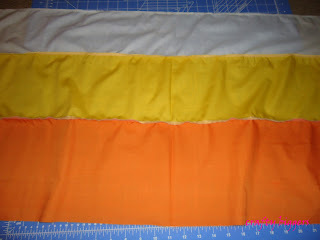 You will want to serge or zigzag stitch the seams so that it doesn't slowly unravel. 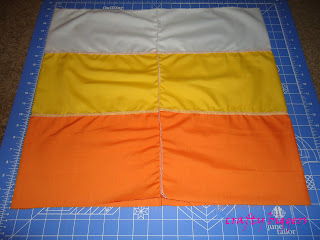 You will want to serge/zigzag stitch along the top of the white panel as well. This is what the back will look like once it is serged together. 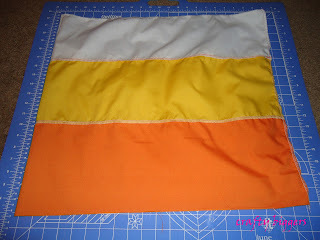 Once that was done I flipped it over and top stitched along the layers so the serged part would lay flat. This isn't necessary unless you have a kid like mine that hates the feeling of seems. 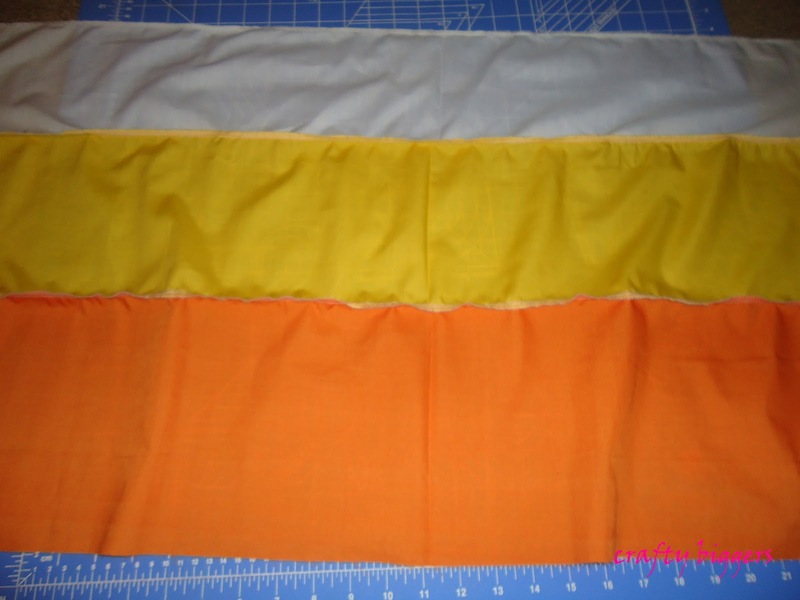 Next you will fold the fabric in half right sides together and sew (and serge) down the side seam to create a tube. 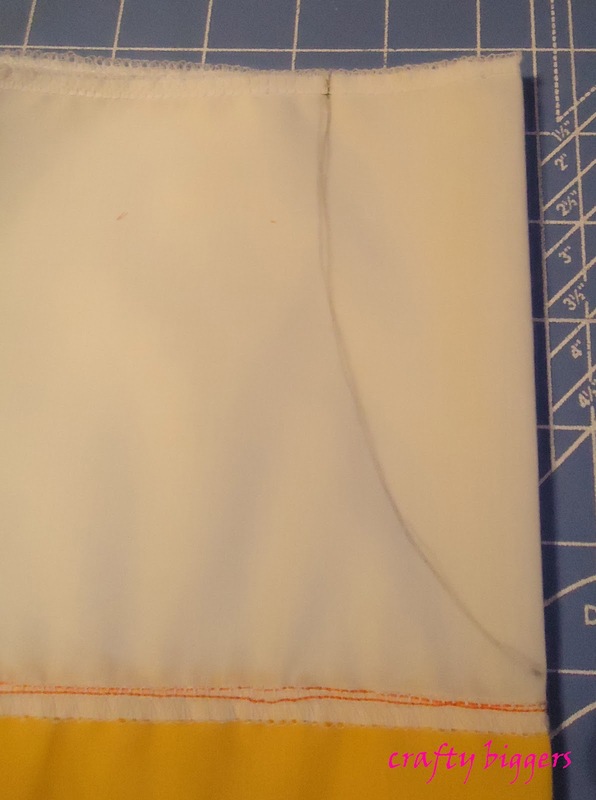 Reposition the dress so that the seam runs straight down the back of the dress. 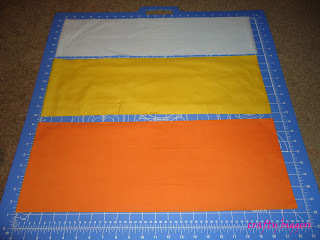 Next you will fold the tube in half along the center seam to mark off the arm area. For both dresses I started my line about 2 inches in and stopped about 1/4" before the orange seam. I just marked mine with pencil because this is the inside and will never be seen. Once the line is drawn, cut along the line through all the folded layers. 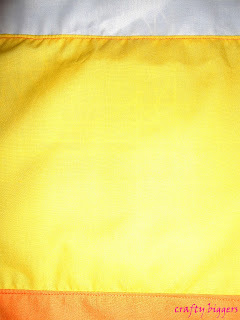 This is what it will look like once you unfold it. This way the arm cutouts will be completely symmetrical. 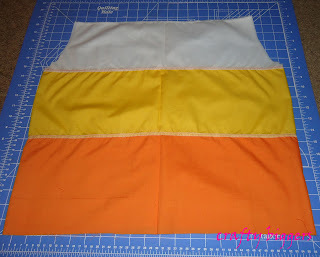 While the dress is still inside out fold over the white edge about an inch (or as much as you need to create a casing for your ribbon) and sew as close the the serged/finished edge as possible. You will want to do this on both the front and back. Now take your ribbon and attach a safety pin to one end. 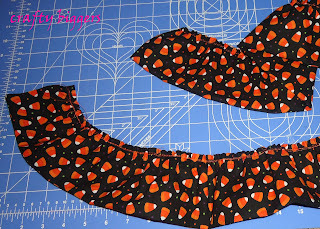 With the dress turned right side out you will feed the ribbon through the front and them through the back leaving both ends of the ribbon hanging out of the same side of the dress. 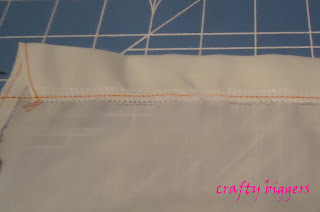 You will need to heat seal of add fray check to the ends of the ribbon to prevent fraying. Once I had my dress assembled I tried it on and realized that it was a little shorter than I would have liked so I decided to add a ruffle to the bottom to add extra length. In the end I like it ruffled better so we can pretend that was my plan all along or you can finish the bottom of the orange panel and call it a day. If you want the ruffle, here's how. 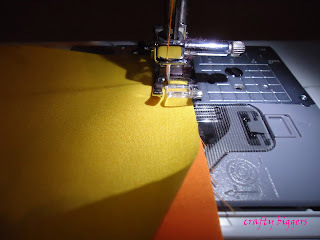 You can easily ruffle without a ruffle foot by setting your machine to the highest tension and the longest stitch them running your fabric through. 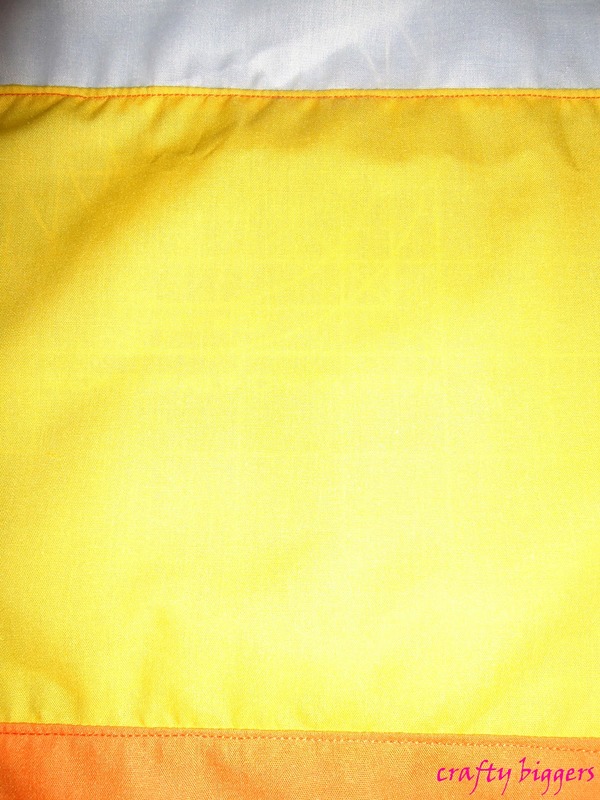 For the ruffle measurement you will want to measure your dress across and multiply that by 4. 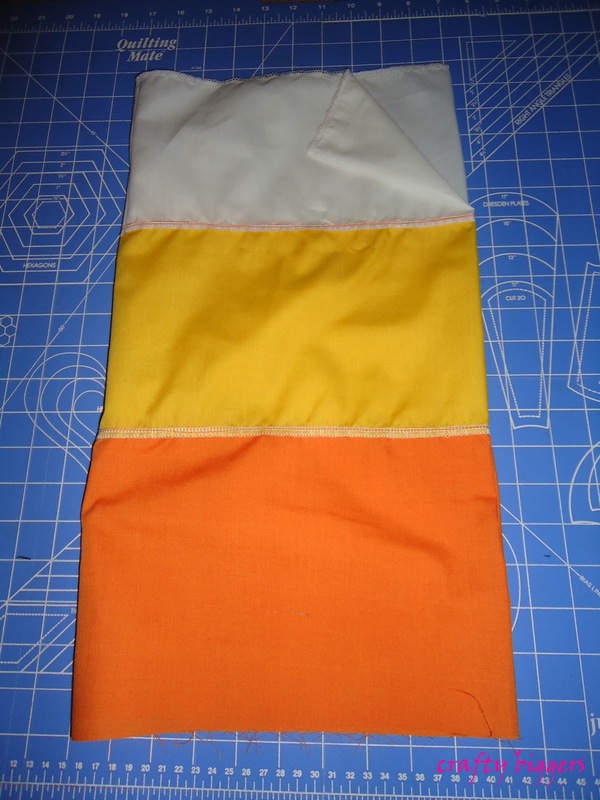 Since mine is 22" across my fabric was 88" long and 7" wide. I folded it in half before I ruffled it. 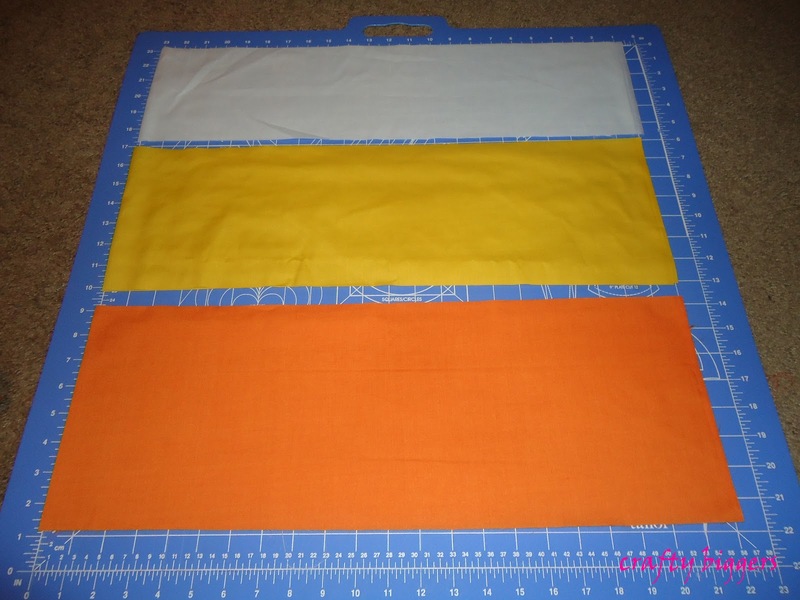 It may require you to sew a couple lengths together to get the full amount. 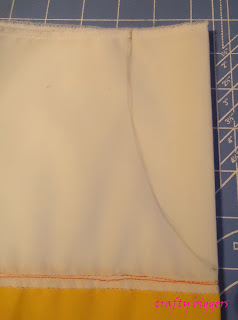 Once you have it ruffled pin it to the bottom of the dress right sides together and sew all the way around. 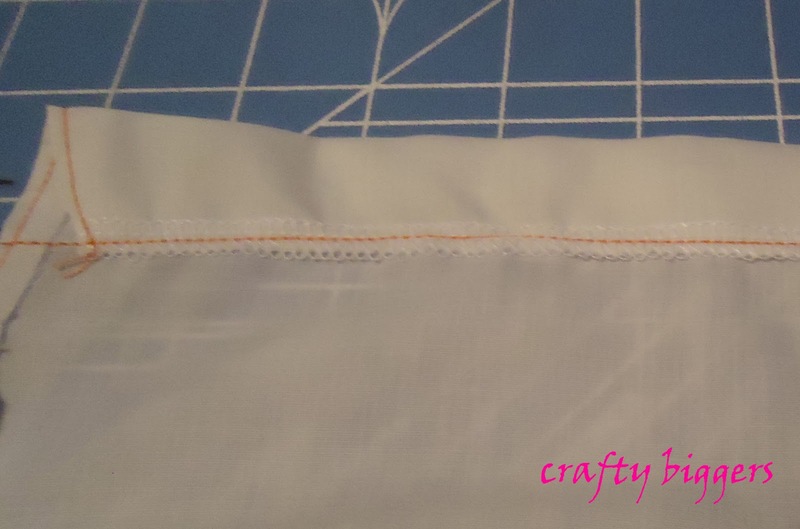 I serged the edge to finish it and top stitched along the ruffle so it would lay down. Sorry I forgot to take pictures of this part. So adorable. I would never have thought of that. I found you through the blog hop and I love your blog. I followed you and would love if you would follow me back! :) Thanks! Thanks! They definitely keep me entertained. Oh my gosh, those are GREAT! G+'d 'em for ya! Love to hear that thanks! Hey Erin! Returning the follow from the Mom's Monday Mingle! I love love love these little dresses! You're babies are presh! Awww! 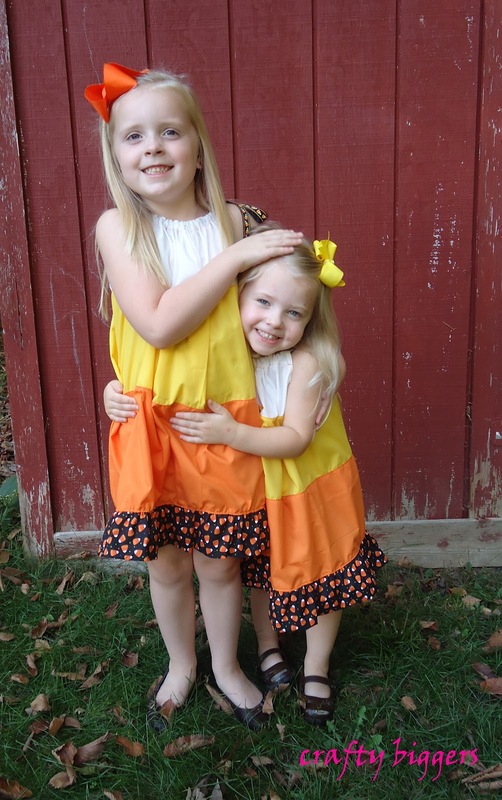 Your kiddos are too cute! Love the dresses! Thanks for sharing at the Pomp Party! Hope to see you back next week! Thanks! I'm a fan of then. This is about the cutest thing I've seen today! Great costumes! And your girls are adorable! Oh thanks! That so sweet of you to say. Thank you so much for linking up to Tell me tuesday!! 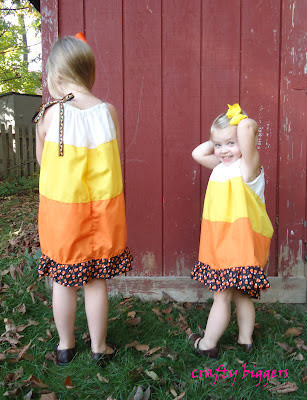 the pillowcase dresses turned out SOOOO CUTE!!! but not as darling as those little blondes...TOTALLY featuring this next Tuesday!!! These turned out so cute. 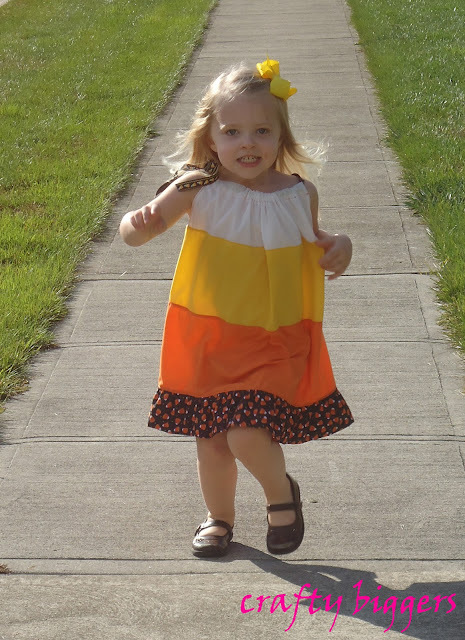 I love that they match and the candy corn fabric trim! Thanks for linking up this week! Thanks! Sometimes fixing 'mistakes' makes it better in the end. Adorable! You did a great job! Thanks for linking up this week at Tuesdays with Tori! Guess what?? Your tasty post is being featured in our Feature Friday post today! We are in love with your sweet treat (the girls look awesome in these candy corn pillow case dresses) and have added you to the Top 10 Super Sweet Halloween Treats. Don't forget that the new linky opens at midnight Friday night! We can't wait to see what else you share! Oh yay!! That's awesome. Can't wait to see it! These are so cute! I want to make one for my baby girl now :) I'm featuring these tonight at the link party. Thanks for linking up! 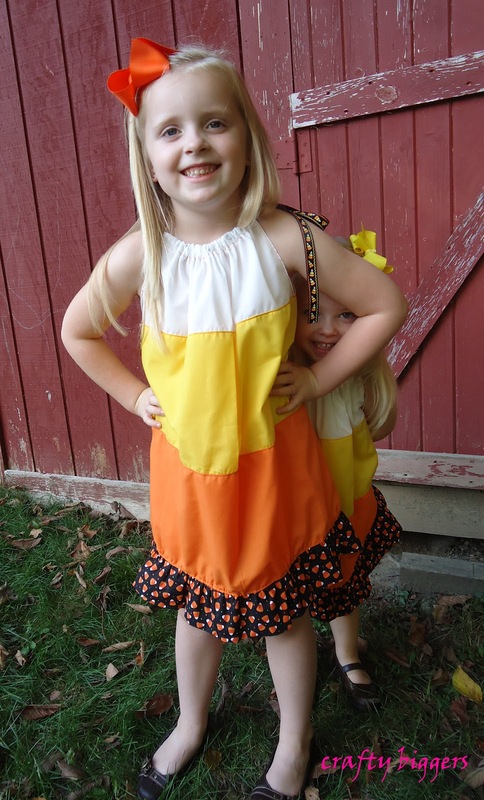 I dont know whats cuter....the girls or the dresses! Great job! Awe thanks! They were being extra "sweet" to each other during these pics. I love seeing all these candy corn tutorials! Those dresses are ADORABLE!! Thanks for sharing + linking up! 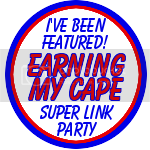 Congrats on your feature at me Super Link Party! I found you through the mingle and had to pin this (even though I don't have any girls...yet). So cute! Thanks! 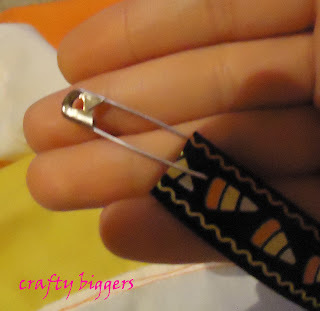 I pin boy stuff and then search for boys to make it for.